Life with Lou: Previous Life? I have never been one to really believe in reincarnation or that we all were maybe someone (or something!) else in a previous life. I got a call from my father-in-law, Danny yesterday afternoon just before going to pick up Ryan from work. He sounded very excited. He asked if I was busy, and if I could check Ryan's email for a picture they had just sent to him. I said that I didn't know Ryan's password, but he would be home soon and I would have him check as soon as we were settled. 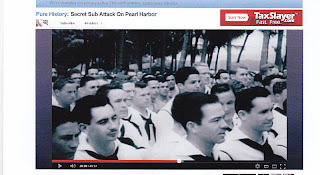 I asked what all the fuss was about and Danny explained that he had been watching a little Pure History documentary on submarines in Pearl Harbor and the day of the attack in 1941. He said that during the documentary they showed a picture that was taken two hours before the bombing started, and something about the picture had given him the chills. He said that there was someone in this photo that we would recognize. My father-in-law isn't much of a jokester, so I felt like his excitement and story was legit. In the back of my mind, I thought - "This is probably a joke and it's probably President Obama's face doctored in somewhere." I think all of you (unless you are new) know what my Hubby, Ryan looks like by now. If you can't tell from the picture, he (well, him in his previous 1941 life) is standing in the front row of this picture in the bottom right corner. The sailor's head looks gigantic (because there is another sailor standing behind him), and his nose is bigger, but everything else is a spittin' image of Ryan! Since yesterday afternoon we have both been bringing up this picture and how crazy the likeness between the two is. Who the heck is this guy? I wish there was someway we could find out. Anyway, you may not be as fascinated by this as we are (and understandably so!) but I knew I had to share this. I'd love to hear if you think this sailor looks as similar to Ryan as I do!